This has been such a fun year for celebrating harvest. 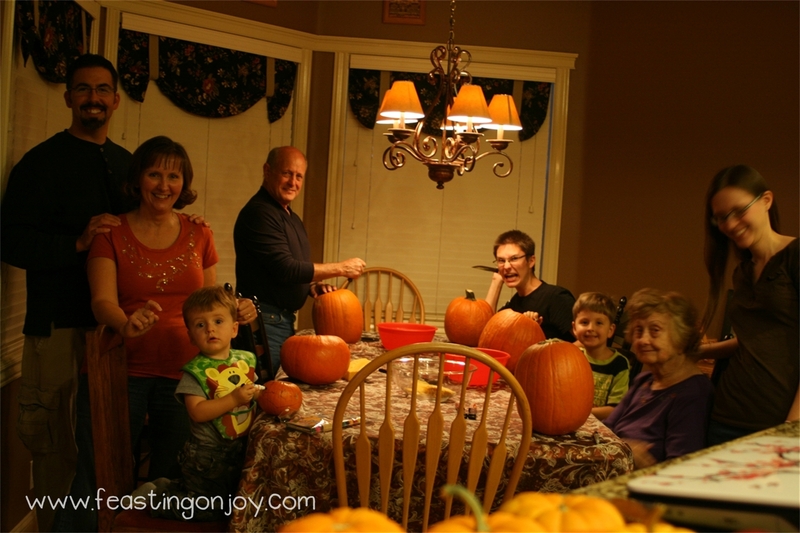 We don’t celebrate Halloween around here but we do have family traditions that get the whole family together and create lasting memories to commemorate the Fall season. I thought I would share what we have been up to in the midst of unpacking and getting settled in our new house. 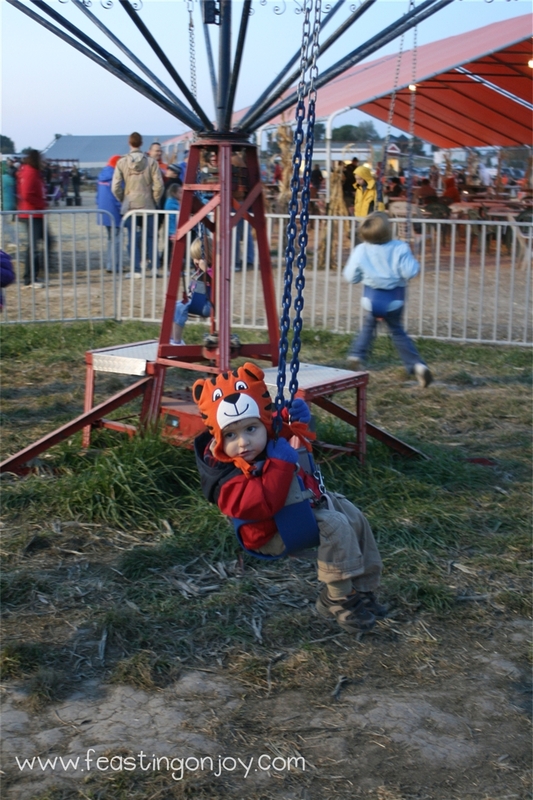 We went to a local pumpkin patch just down the street from us. It kind of reminded me of the Roloff family farm from the Little People Big World TLC Show. 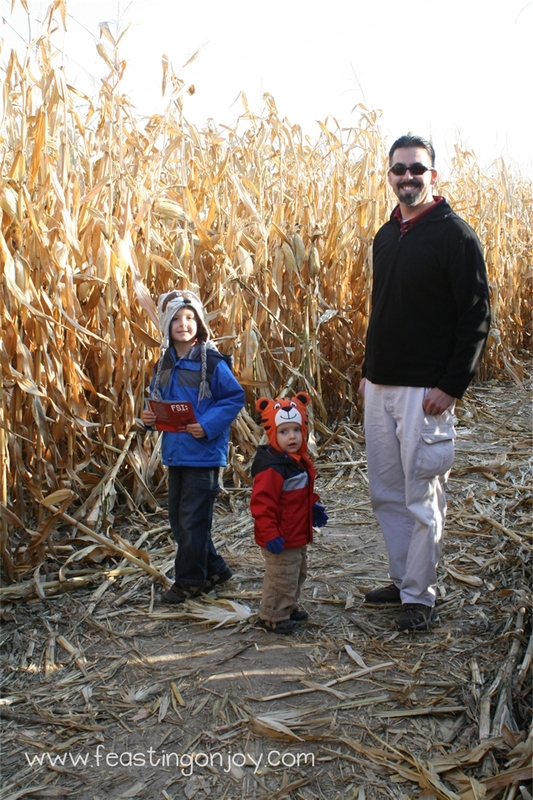 They had a HUGE corn maze – actually two. One of them was 3.2 miles to get through. I had never done a corn maze before and it was really cool. They made it even more fun because they had check points all over the place where you could punch this card with a corn kernel punch. 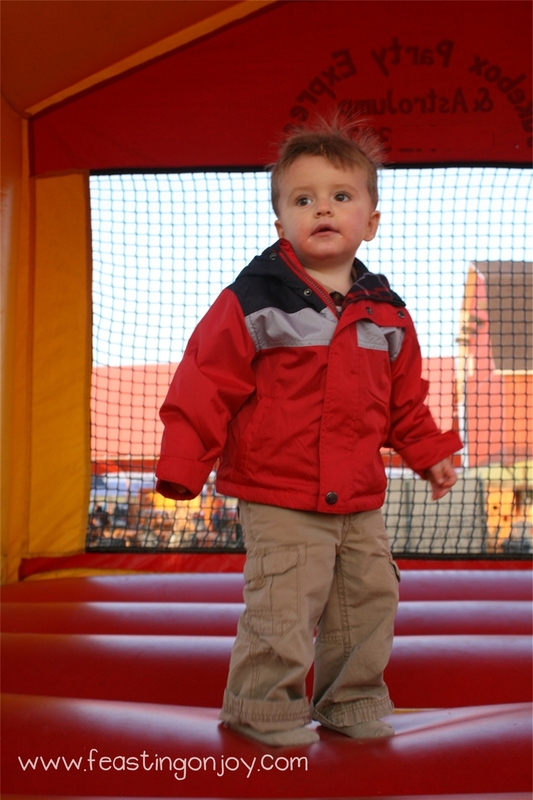 Cody got to go on his first jumpy jump. 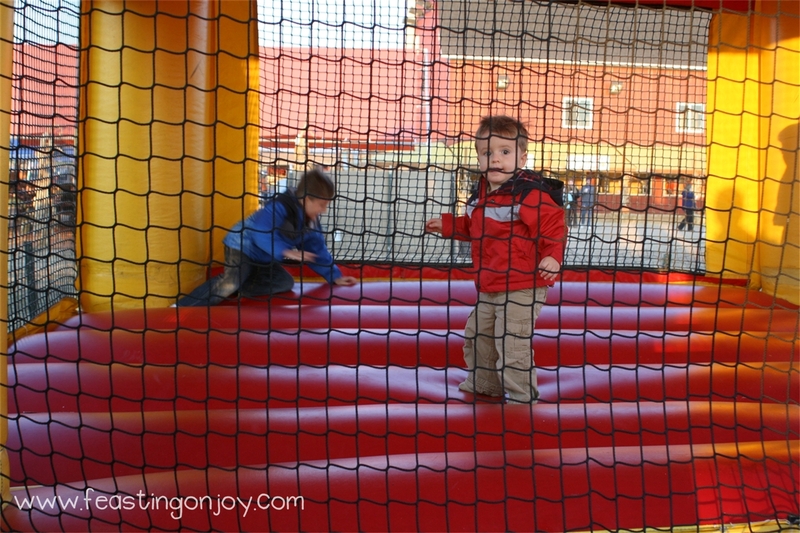 It was the first time where there weren’t fifteen million kids in one bounce house. He loved it. He could have stayed in there for hours. 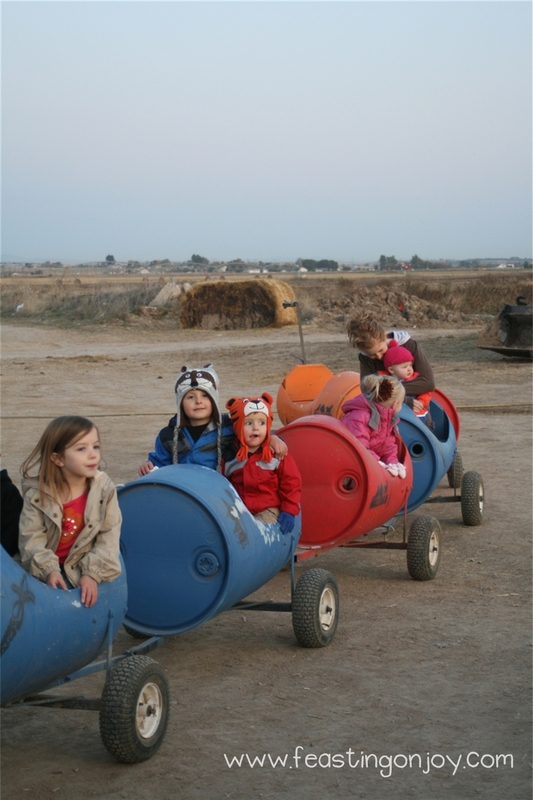 The owners of the farm created a train for the kids to ride on from water barrels. They were all pulled by a tractor and it took them around the huge red barn on the property. The boys loved that. 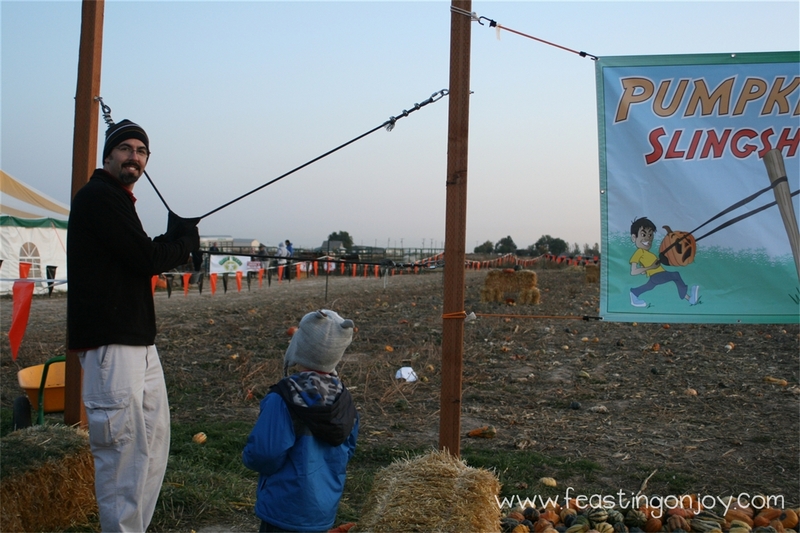 Steve loved the pumpkin slingshot. 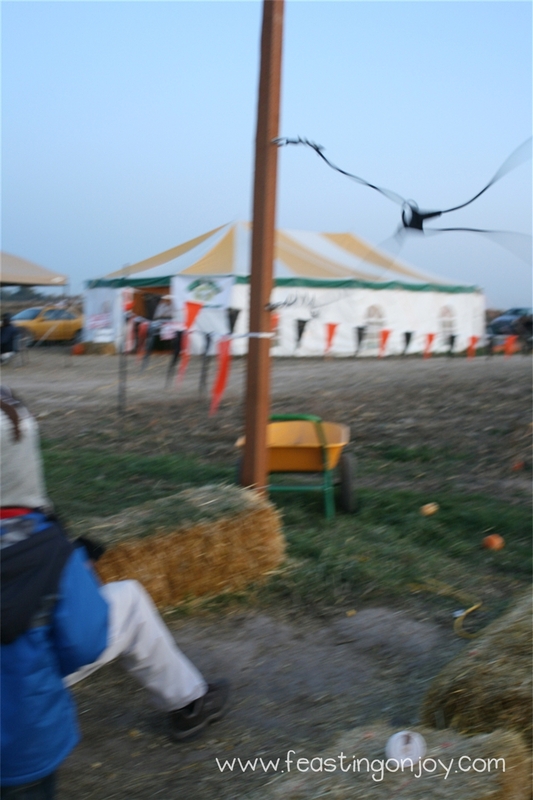 He was able to shoot 3 pumpkins out in to this field and watch them smash to smithereens! Boy stuff! 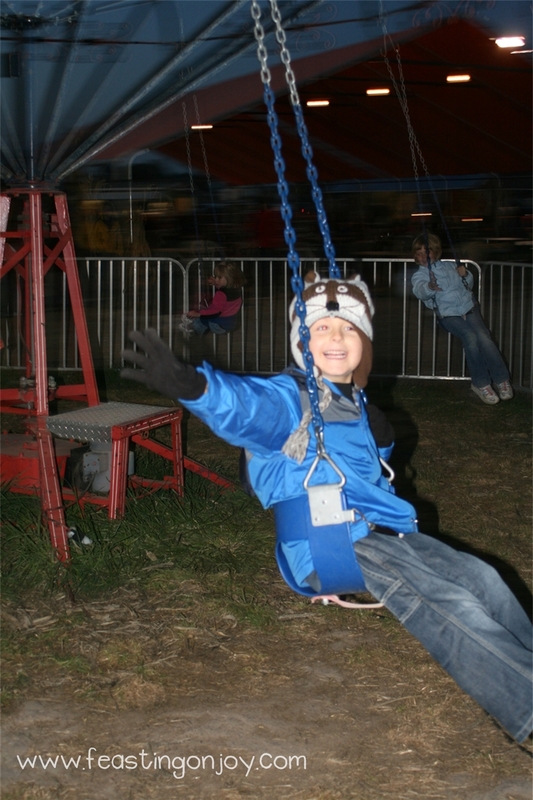 They even had the ride where you sit in the swings and go round n’ round. A small one so Cody could go on too. He had the hugest smile when it first started up. I loved this ride when I was little. Now I would get dizzy and puke within the first 30 seconds. 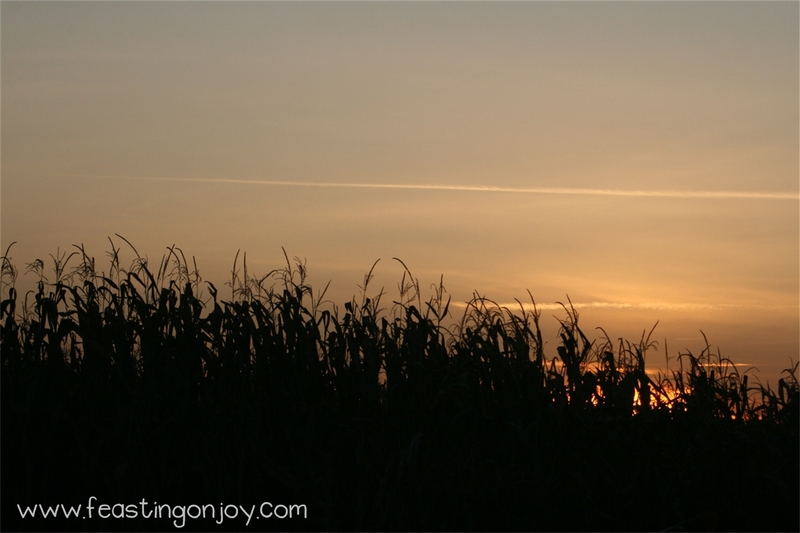 Here was the sunset over the corn. I thought it was a pretty silhouette. This place also had something gluten free for me to eat form the snack counter – a loaded baked potato. It was nice to have a hot meal in the 40 degree evening. I have gone to a pumpkin patch every year since I was a little girl. I knew we would be able to find a fun new one in our new state! Yay! 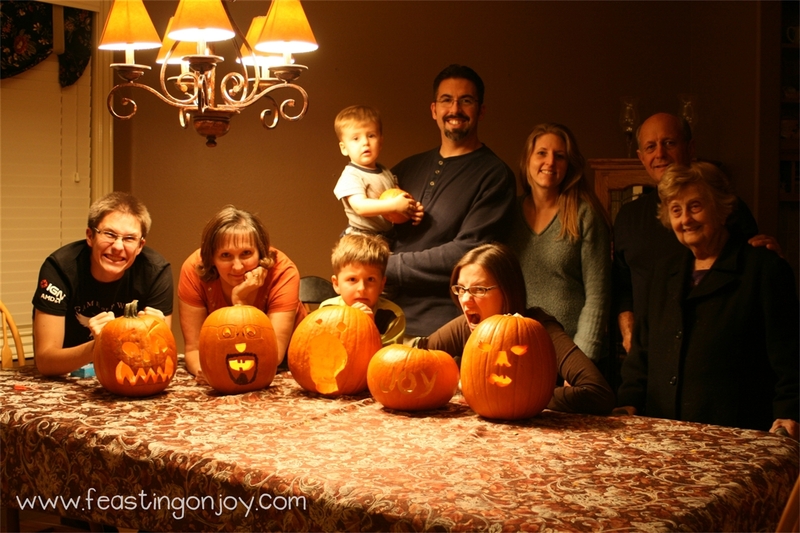 Each fall we also have a tradition of carving pumpkins together as a family. We each carve our own and don’t show anyone until the end. It is a big surprise. When the kids are too young to carve they get to draw on a little pumpkin. This is the second year Corbin got to carve a pumpkin and he has BIG plans for his pumpkin this year. It was fun because my Aunt, Uncle and Cousins participated this year and they took it to the next level and awarded prizes to the first and second. That made it even more competitive. We really had a blast! 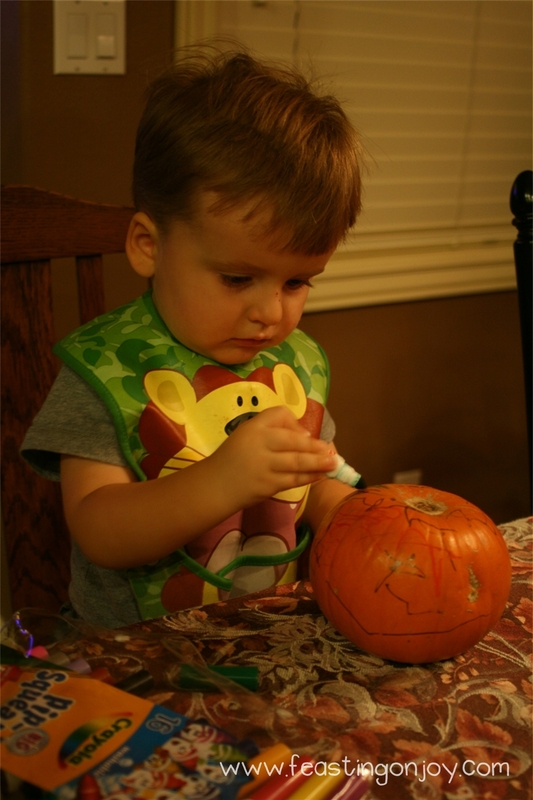 Cody coloring his pumpkin for the first time. He was in heaven. He loves to “rite” as he calls it. Don’t mind my evil cousin in the background! He cracks me up. He really isn’t evil… he’s just frustrated because it is the first time he carved a pumpkin! Here is my sweet cousin Sarah and my Grandma. My grandma helped pick the seeds out of the muck so we could roast seeds. As my Grandma walked away to wash her hands she said “This is SICK!” It made me laugh. Corbin won first place and I wish I caught his astonished look on camera. It was so precious. He just couldn’t believe that he won. 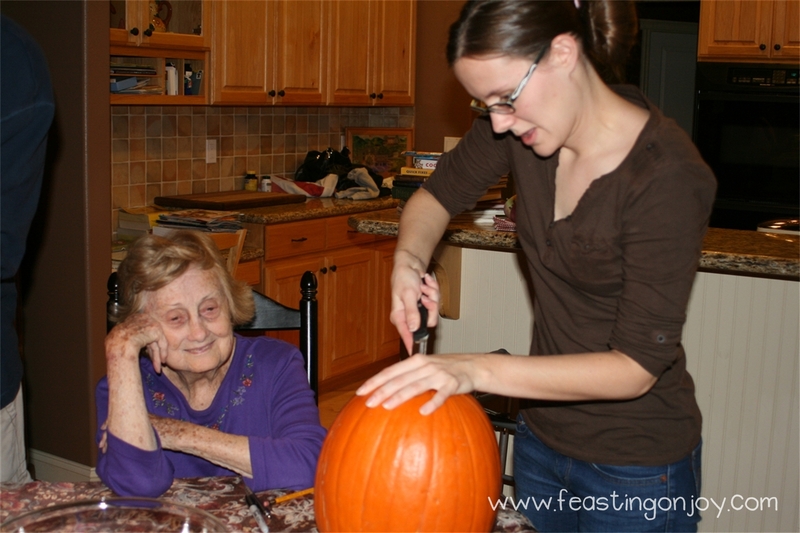 He says now that his favorite thing in the whole world to do is to carve pumpkins! 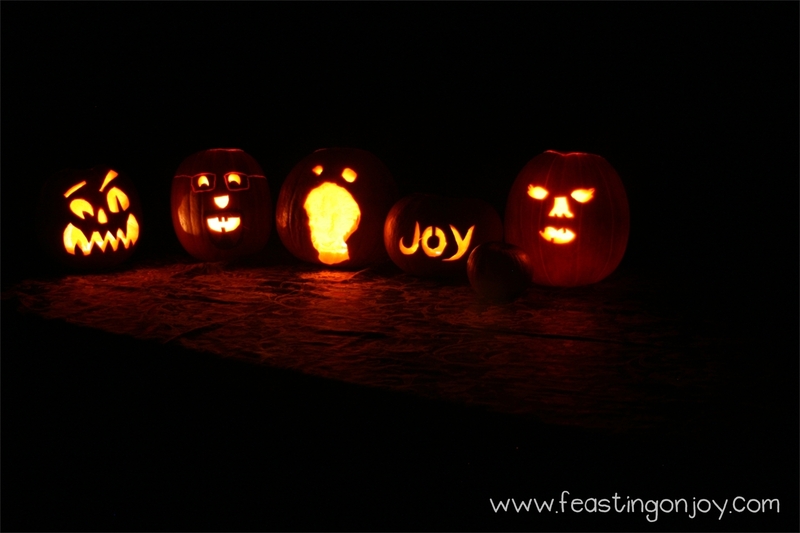 My family also has a tradition they shared with us of turning of all the lights and chasing this kids with the pumpkin. My Uncle did this and Corbin loved it but Cody freaked – as any two year old would do. Now every time he sees Corbin’s pumpkin (the one Uncle Roger used) he says “That scauwed me!” I told my Uncle he may have to come over at 2am when I have to console Cody from his pumpkin nightmares. What a fun harvest we had! I am really looking forward to our November traditions that we have with the theme of gratitude and service. I hope to share some of those with you. What a special time withthe family. Wish I could have been there with you.